It’s Wednesday night, and it appears to be ‘ladies night’ at the Regal Cinema at the Green Hills Mall in Nashville. One hundred tickets were provided to the community to view the movie “Hidden Figures” before it officially opened in a limited number of theaters nationwide. “Hidden Figures” is the untold story of three brilliant African American women who worked at NASA during segregation and played a vital role in man’s flight to the moon. Following the special screening of the film, a group of local women participated in a panel discussion. Belmont University was in the mix as Dr. Lakisha Simmons, assistant professor in the College of Business, shared her experiences as an African American female pioneer. Simmons is the founder the Homework Suite mobile application. Reacting to the film she said, “When you make an impact, who can deny you? Even if it takes 50 years.” And it did take that long for the masses to learn the integral role three African American women played in the U.S. space program. The movie recreates the lives and experiences of NASA employees Katherine Johnson (Taraji P. Henson), Dorothy Vaughan (Octavia Spencer) and Mary Jackson (Janelle Monáe). The trio were real world rocket scientists who helped to create the mathematical calculations needed to get, among others, the late astronaut and former Senator John Glenn to the moon. As a child, Johnson’s teachers knew her calculating genius. In a scene with her parents near the beginning of the film, an administrator tells them, “You have to see what she becomes.” Thanks to “Hidden Figures,” millions will now see and know Johnson as “the computer,” the mathematician’s nickname. Creating analytic geometry while dealing with a segregated society, few knew about her sacrifice as an African American woman who couldn’t use the same restroom as her white co-workers. On the screen, it took Henson forty minutes to run across the NASA complex to the West Computing Lab Building to use the bathroom marked “colored restroom.” This was Hampton, Virginia in 1961. Vaughan wanted a promotion to supervisor, as that’s the role she was fulfilling for NASA. She ran the West Computing Lab, the section run by African American women, without pay, title or seemingly training. Clearly ahead of her time, Vaughn foresaw the entire division’s replacement by new technology, the IBM computer. Instead of panicking, waiting or wishing it away, Vaughn took her son to the library, read a book on the Fortran computer programming language and learned how to program the new system. Glenn passed away in 2016 prior to the film’s release. He was portrayed as an integral part of Johnson’s success, consistently supporting her work. When a tough call had to be made, he told NASA to depend on Johnson to make it. Johnson’s supervisor Al Harrison was portrayed by Academy Award winning actor Kevin Costner. In the film, Harrison was intensely driven and didn’t seem to care about Johnson’s race or gender. The goal to beat the Russians was clear, and Harrison didn’t care which team member made it happen. Jackson, the third major character, was capable of being an engineer, but due to her race she could not legally take the classes for the position. She petitioned the Virginia court for the right to take classes at the whites-only institution, the only place the courses were offered. In the movie, she was granted access to take night classes only. After the film, the panel shared wisdom for the ages. Simmons noted the journey is easier when helping others is leveraged. “Mentor someone. Get a mentor. Having someone to help you get up the hill and then you pulling someone behind you” is the pathway to success, she said. As many educators push American students to embrace science, technology, engineering and math, “Hidden Figures” fits right into the equation. Other panelists were the mother-daughter duo and mobile app developers Kerry Schrader & Ashlee Ammons Founders of Mixtroz Social Engagement Platform and Meryl Johnson, director of digital strategy at the Country Music Association. The panel was moderated by Isaac Addae, a business professor at Tennessee State University. Addae is also one of the founders of Conscious Conversation, a Nashville-based group focused on galvanizing the general public around issues of community and economic development in metropolitan communities. 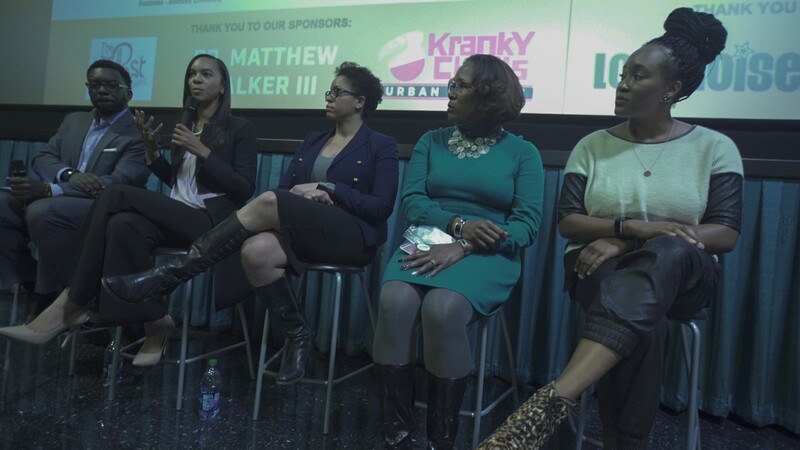 They partnered with Clerisy Circle to host Reel Talk on Hidden Figures, an evening of thought-provoking film and dialogue. Indeed, Hidden Figures provides audiences with fodder for discussion since its box office debut surpassed other popular releases. Hidden Figures grossed $22.8 million in its opening weekend.